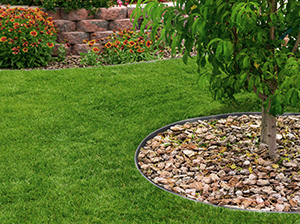 Coyote Landscape Products launched four new steel lawn edging product accessories: Start & Stop end pieces, ArborEdge tree rings, Edge Stakes and Corners edging corner pieces. 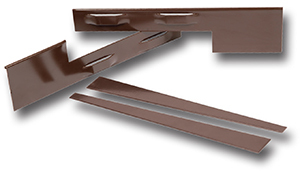 All the new products, excluding Edge Stakes, are available in green, brown, black, galvanized and raw steel finishes. The new Start & Stop pieces allow landscape companies to provide a clean, structured landscape edge for customers, according to the company. The units are available in several thicknesses. The ArborEdge tree ring helps to prevent lawn care equipment from damaging trees, the company said. The ring has interlocking stakes and is available as a one-piece unit or as separate sections. Coyote Landscape Products introduced three types of stakes in its Edge Stakes series, including Hairpin Edge Stakes, Interlocking Stakes and J-Stakes. The Hairpin Edge Stakes are 10-inch stakes made from and 8-gauge wire rod, available in plated and raw steel finishes. The stakes fit over the top of the edging and are used to keep unpunched edging products in place, the company said. Interlocking Stakes, available as a standard unit or heavy-duty, are included with all Coyote EcoEdge and ToughEdge powder-coated carbon steel products. The company’s 11-gauge J-Stakes, used to keep plastic, composite or wood edging in place, are 14 inches long with a small bend to lock in edging. Coyote Landscape Products also introduced Corner Pieces to connect two pieces of edging. The 24-inch pieces eliminate the need to bend or cut edging, according to the company. The units can be used to connect two pieces of steel edging together to form a 90-degree angle. Denver, Colorado-based Coyote Landscape Products, a division of Acme Manufacturing Co., said its product line contains at least 70 percent recycled steel.